We had an interesting conversation at a guild meeting this year. What topics do we want to cover in the meetings next year? One suggestion…where do you find your design ideas? HMMMM!!! I’ve been thinking about this for the last few weeks. What inspires that spark to take the ‘what if road’? 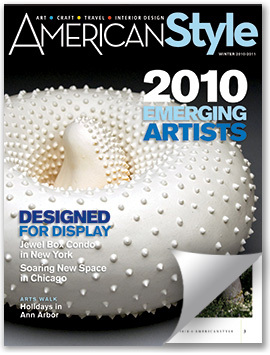 My favorite resource for inspiration is American Style Magazine. The articles cover a wide variety of topics of interest to artists and the ads are inspirational eye candy. Did you notice the article about our Mississipppi Craftsman’s Guild naked calendar? Think I should volunteer next year? I missed that article…but I think you would be perfect!!!! I just subscribed and got my first issue a few days ago. I’m loving it. You are so right when you say it is a great source for inspiration.